The house sparrow is in trouble, in the UK numbers have plummeted by over 70% since the late 1970s and the picture is similar across Europe. 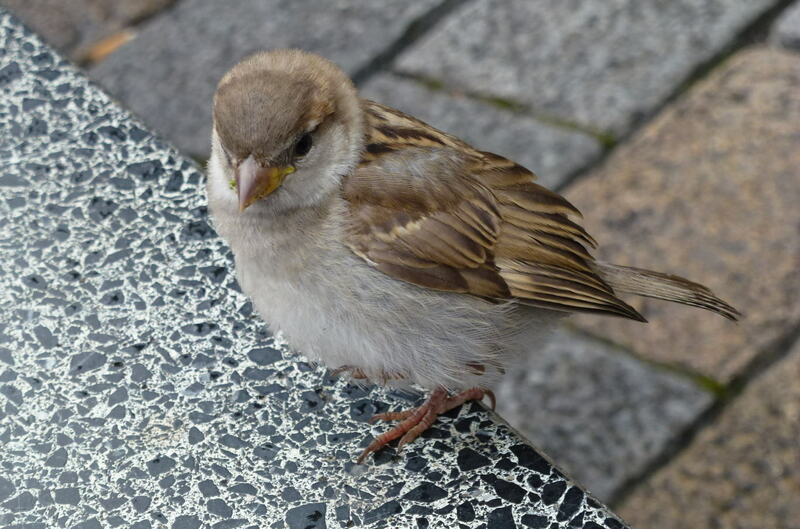 This young female house sparrow looks well fed but things will get harder for her in the winter. Perhaps more surprising is that the decline is more pronounced in urban areas than it is in the countryside. The reasons for decline in rural areas are fairly well documented with widespread intensive farming leading to loss of habitat and insecticides decimating insect populations upon which the sparrows feed. In urban areas the decline is less well understood. There are numerous theories for the urban decline including electromagnetic radiation from our ever expanding mobile networks disrupting breeding behaviour and “clean” emissions from modern motor vehicles that are poisonous to insects. 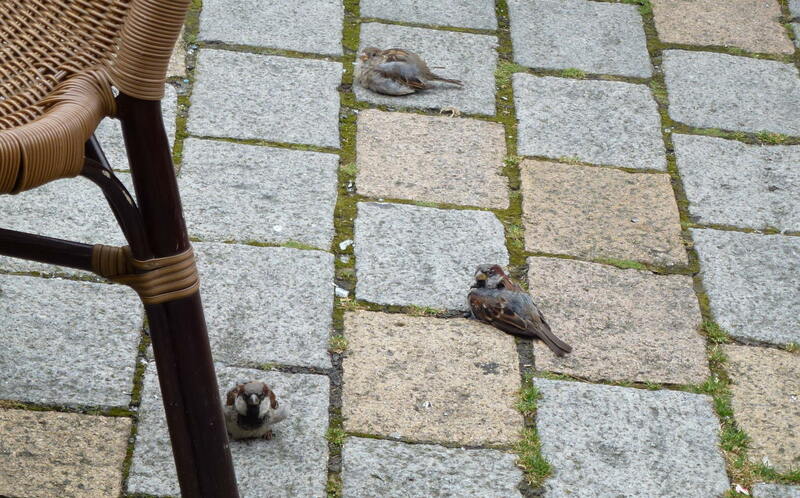 These house sparrows are taking a rest between chair legs in an outdoor restaurant. Perhaps a more probable explanation is that our push for environmental efficiency is actually having an adverse affect on this well loved bird. For example, over the last few decades insulation of housing to improve energy efficiency is reducing available nesting sites. Many people now have the eves of their homes covered with plastic shielding and any holes are plugged to prevent loss of heat. These untidy nooks and crannies are prized nesting sites for house sparrows. Additionally food is more robustly sealed these days and we are recycling our unwanted food in closed plastic bins that the birds cannot access. These are just some of the many theories for the rapid decline in sparrows but all seem to have one common link – human expansion. It’s not just sparrows either some of Europe’s most common bird species are in dramatic decline. 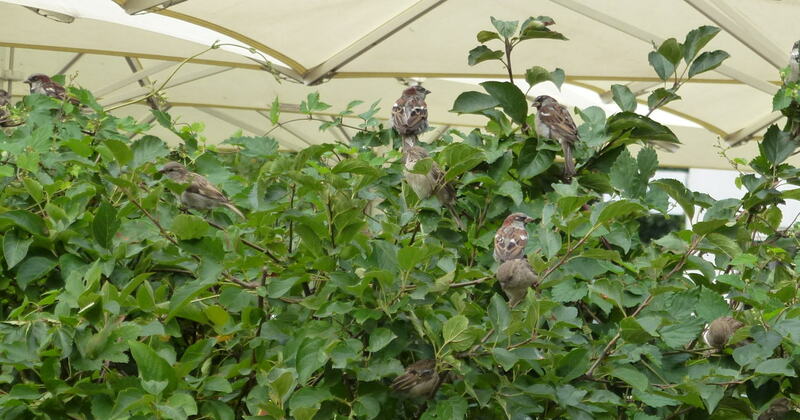 A group of house sparrows gather in a shrub. 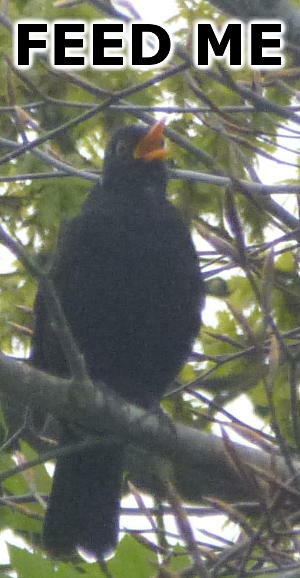 Providing food for birds in your garden is an easy and enjoyable way to help many of our declining species. If sparrows do not feed sufficiently during the winter they will be in poor shape in the spring when it is time to breed. During the summer easy food sources such as bird feeders allow parent birds to quickly feed themselves whilst looking for harder to find insects for their young. Putting up a nest box is a great way to help sparrow numbers increase. If you are able to safely put a box up high near the eves of your house then this will be particularly attractive to sparrows. When placing a nest box select a sheltered spot, out of reach from predators and also out of direct sunlight. A nest box that is exposed to full sun in the afternoon is likely to overheat and cause the death of the chicks inside. Don’t use insecticide and leave a section of your garden, no matter how small, to go wild. This will encourage the insects and plants upon which the sparrows feed. In return you’ll hopefully have a garden full of sparrows eating your greenfly and lifting your spirits. The robin may be Britain’s official favorite bird but without the humble sparrow are gardens, parks and greens would never be the same again.